The Pre-Purchase Pest Inspection is restricted to only what is visible to the eye. 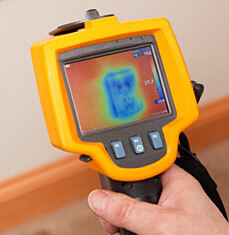 This will identify obvious past and current pest activity and damage. However, termites may be active within cavities or within concealed timber framed walls, and their presence cannot be detected until the damage is obvious by sight and by destruction of the materials. A thermal imaging camera, in conjunction with moisture metres, is an effective method to assess pest damage to the hidden sub-structure of any building. We therefore recommend the Thermal Camera Pest Report to obtain a more comprehensive assessment of the property in question. With the use of a thermal imaging camera, our report will assess and comment on the condition of the wall framing and sub-structure of the building.